The principle function of oligodendrocytes is to provide support to axons and to produce the Myelin sheath, which insulates axons. Myelin is 80% lipid and 20% protein and allows for the efficient conduction of action potentials down the axon. 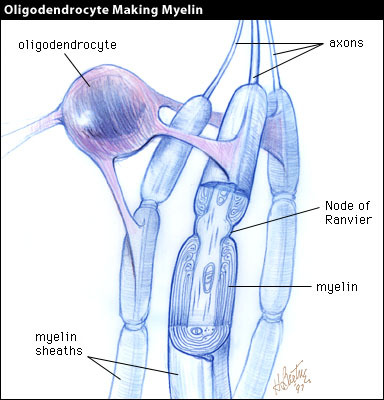 Oligodendrocytes unlike Schwann cells of the PNS, form segments of myelin sheaths of numerous neurons at once. As can be seen in the above illustration, the processes of a given oligodendrocyte wrap themselves around portions of the surrounding axons. As each process wraps itself around, it forms layers of myelin. Each process thus becomes a segment of the axon's myelin sheath.